Footwear fashion boss Tamara Mellon has told a court her ex-husband is a former drug addict who behaves like a child. 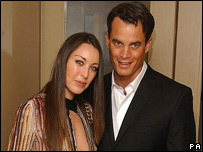 Matthew Mellon, the 43-year-old heir to an American oil and banking dynasty, was "totally incapable" of dealing with his finances, his former wife said. He is on trial for allegedly asking private detectives to spy on her finances during divorce proceedings. Mr Mellon denies a count of conspiring to cause unauthorised modification of computer material. Mrs Mellon, 38, who is the head of the Jimmy Choo footwear empire, added that her former husband had a memory that made him "miss planes like other people missed buses" and that he needed a "nanny" to get through life. The multi-millionaire president of the shoe manufacturer was giving evidence for the prosecution during Mr Mellon's trial for allegedly hiring a private detective agency, Active Investigation Services (AIS), to invade her financial privacy. The court heard that she met Mr Mellon 10 years ago at a meeting of Narcotics Anonymous at a time when they were both recovering drug addicts. Mr Mellon, heir to a £5bn oil and banking fortune, married Tamara Yeardye in a society wedding in 2000 at Blenheim Palace in one of the society events of the year with Elizabeth Hurley and Hugh Grant among the guests. Mrs Mellon started divorce proceedings in 2004. Mrs Mellon told London's Southwark Crown Court his "absent-mindedness" was so severe she had been unwilling to leave him with their four-year-old daughter, Minty. She did, however, described him as a "fantastic father" who was "happy, playful, excitable and very sweet" and who remained her "best friend". Mrs Mellon told prosecutor Miranda Moore, QC, that as part of the settlement negotiations her former husband's solicitors sought the disclosure of the financial state of her company. But her legal team refused to co-operate. Mrs Mellon said she became suspicious when she was sent three emails claiming to be from "A Friend" which offered to dish the dirt on her husband. But the emails were an attempt by AIS to hack into her computer by making it possible to record the keystrokes she made on the machine's keyboard. Mr Mellon's QC Nicholas Purnell then cross-examined Mrs Mellon, who was asked about a dossier of information containing details - including keystroke logs - found at her ex-husband's home when he was arrested. Mr Purnell asked if Mrs Mellon thought her husband capable of understanding the dossier, which had been supplied by AIS. "Absolutely not," she replied. "Matthew cannot even read a comic, let alone a legal document. There is absolutely no way he could do it." She also added that as far as she was aware, Mr Mellon had never even read a book. Mr Mellon, now divorced and living in Belgravia, central London, denies one count of conspiring to cause unauthorised modification of computer material between 1 July, 2004 and 4 February, 2005. He is on trial with four others at Southwark Crown Court. Also in the dock is ex-policeman Scott Gelsthorpe, 32, from Kettering, Northamptonshire, who helped run AIS, agency employee David Carroll, 58, of Highgate, north London; Daniel Carroll, 36, from Westminster, central London; and Maurice Kennedy, 58, of Barnet, north London. Mr Mellon's co-accused variously deny 15 counts of conspiracy, alleging fraud, the unauthorised modification and interception of computer material, and criminal damage. After Mrs Mellon had given her evidence, her solicitor read a statement on her behalf outside court. It said: "Tamara was obliged to come here and give evidence and tell the truth. "She would like to make it clear that there is no bitterness between her and Matthew. They remain good friends and are focused on bringing up their daughter." The trial was adjourned until Friday.